Oaxaca is located in a coffee growing region, and coffee shops abound in this increasingly popular city. 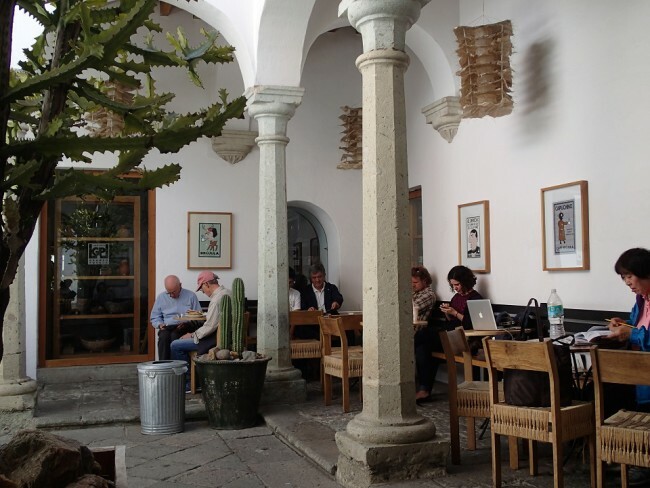 If you’re looking for the best coffee in Oaxaca, keep reading! While it’s hard to get a bad cup of coffee in Oaxaca these days, that doesn’t mean all places are created equal. 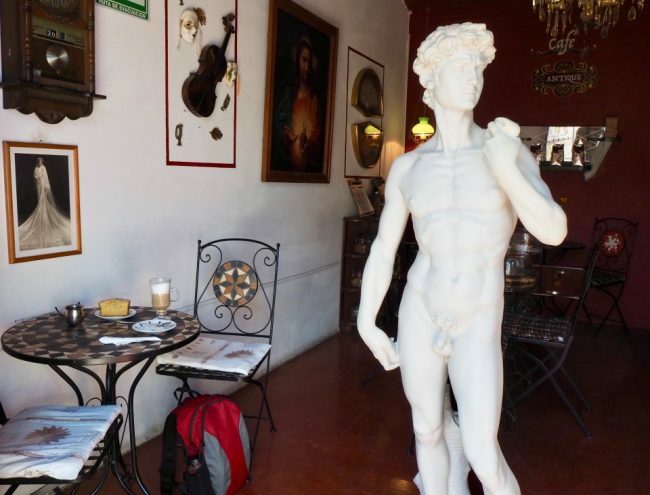 After trying out several coffee shops during both my 2014 and 2019 visits (a total of 9 weeks), I give you below my favourite places to sample some of the best Oaxaca coffee. My benchmark drink of choice is the cappuccino. If the coffee flavour makes it through all the milk, and the texture is smooth with a nice thick foam that doesn’t disappear the moment you stir it, then it passes my test. 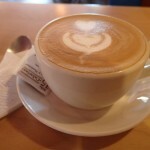 In addition, I like a coffee shop with a nice atmosphere, friendly service, and affordable coffee. Most (if not all) coffee shops in Oaxaca give you the choice between drinking your coffee in the house (por aca) or taking it out (para llevar) just like Canadian or American shops. 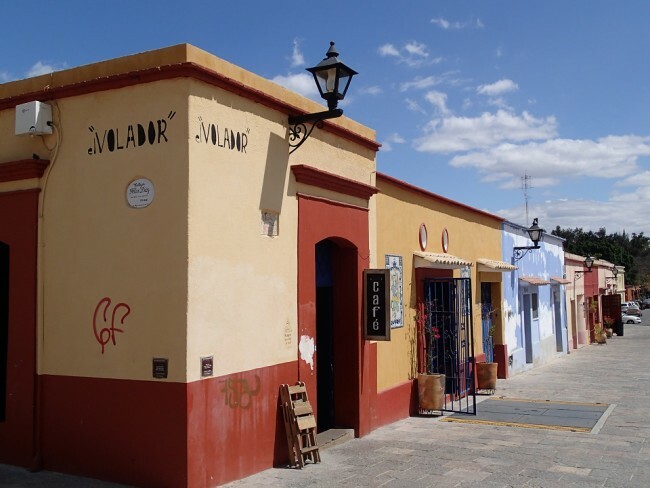 All the listings below are located either in the colonial centre of Oaxaca or the popular Xochimilco neighbourhood. Prices are given in Mexican pesos (M$). As of April 2019, $1 CAD is worth about M$14, and $1 US is worth about M$18.75. 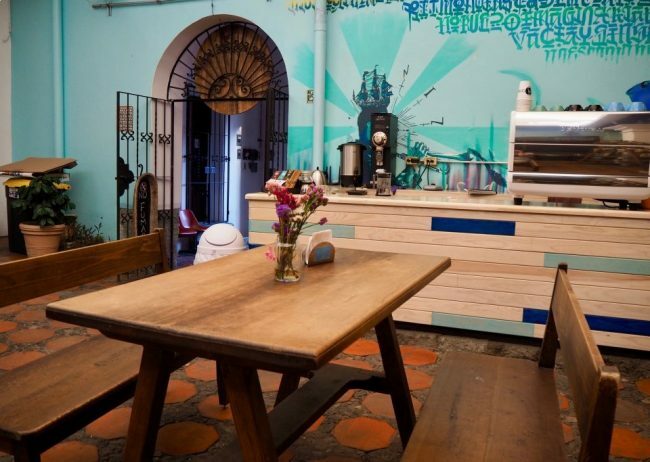 With just three tables and two chairs at the bar, El Volador is a tiny place that serves freshly ground espresso coffee as well as homemade juices, pastries, and simple sandwiches. The cappuccino (M$30) is served in a tall glass. The friendly barista is usually up for a chat if you want to practice your Spanish. She wants you to know that although she serves the best coffee in Oaxaca, the beans are actually from Veracruz! You can also buy coffee beans ground to your requirements. They have WiFi. Hours: 8 AM to 9 PM Mon-Sat. Closed Sunday. This is a small chain (with two locations on the main pedestrian drag Alcalá, and two further afield) offering a quick turnaround and consistently good coffee in North-American style shops. Don’t expect much beyond a “Buenos dias” here. The baristas are very busy. Cappuccinos solo/double/triple cost M$40/45/50 pesos. Pastries are on the expensive side. They have WiFi. Address: Macedonio Alcalá 104 (large outdoor terrace) or Macedonio Alcalá 407, Plaza Santo Domingo (indoor, high tables). Hours: 7:30 AM to 10 PM Mon-Sat; 8:30 AM to 9 PM Sunday. I was told this was the best coffee in town. My cappuccino was indeed very tasty, but I had to wait 15 minutes for it, and then had to wait some more for the bill. (I was in a rush so I left the money on the table). This, combined with the narrow and rather claustrophobic space, didn’t leave the best impression. It seemed like customers who ordered their coffee “to go” were served first, so you may want to try that. They roast their own coffee and are usually very busy. The cake portions are huge! I got attracted inside this quirky cafe by the sign outside. Fortunately it was more cheerful than the placard lead to believe. I found a modern decor in black, red, and grey with padded chairs and books to read (some in English). The owner, who opened this cafe in July 2017, carefully made me a tasty cappuccino (M$28 for a regular). The place was really quiet mid-afternoon, with classical and jazz music adding to the calm atmosphere. 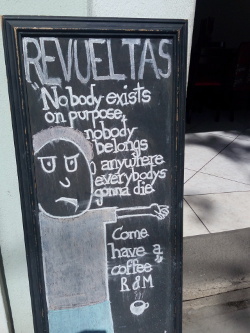 Café Revueltas also serves some egg dishes, sandwiches, quesadillas and a few pastries, but I didn’t try the food. They screen free movies occasionally. They know their coffee at Cafébre, using different brewing methods (V60, AeroPress, Chemex, Japanese Siphoning) and a big fancy espresso machine. They also offer coffee workshops and tastings, and sell their own specialty coffee. My cappuccino was rather small for M$34 but it was high quality. 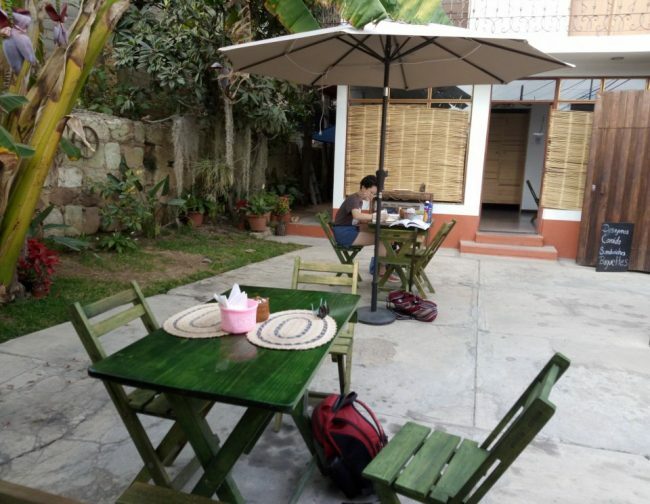 Pastries, sandwiches and salads are also available in their large covered courtyard with WiFi. Hours: 7:30 AM to 10:00 PM Mon-Sat; 8:00 AM to 10:00 PM Sunday. Blasón has two locations in downtown Oaxaca. 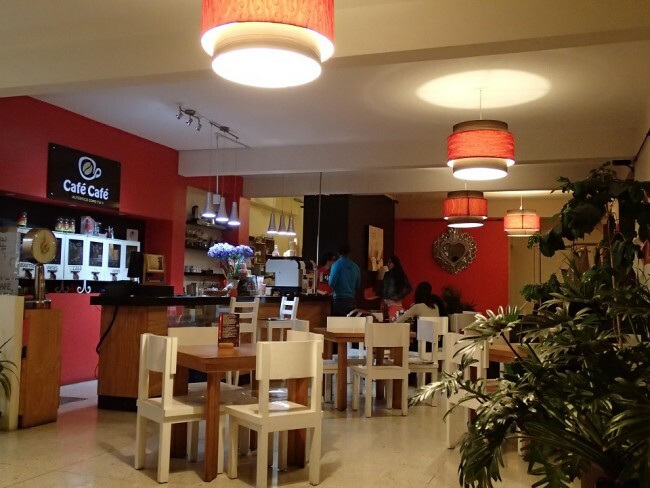 I went to the one on García Vigil and found a spacious coffee lounge with view on the street. There were several young Mexican with laptops here, so this could be a good place to work. My cappuccino was large, and served in a beautiful ceramic mug for only M$25. (Lattes are the same price). They also sell their own brand of ground coffee. A beautiful airy space decorated in shades of red, white, and dark brown. Large cappuccinos are served in tall glasses, and you can purchase beans. What’s the downside? The highest prices I’ve seen so far in this town: 36 pesos for a cappuccino (although it’s a big one). This tiny place offers a few tables in a pleasant courtyard and a few more inside. Drink your coffee in the shade of a banana tree while enjoying the WiFi and the wide range of music from Latin to 1970’s American rock. 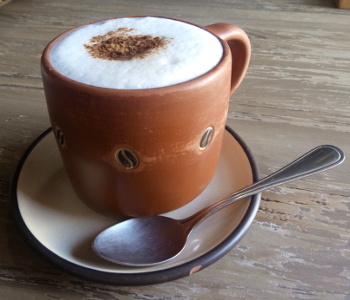 Cappuccinos are served in brown ceramic mugs and come in three sizes: small (M$23), medium (M$29), and large (M$32). These are the cheapest prices I’ve seen in Oaxaca! And the quality doesn’t suffer either. My cappuccino was so smooth that I didn’t even need sugar. But you may want to say yes to cinnamon (“canela”). They also serve pastries, sandwiches and breakfast items. 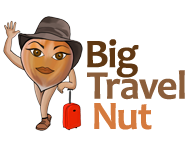 Hours: 8:00 AM to 9:00 PM Mon-Sat. Closed Sundays. You can’t miss this blue building with a large status of The David greeting you in the entrance! Inside the decor is eclectic, and includes of course “antiques”, from prints to old cameras. 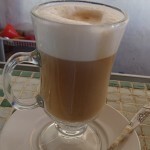 The owner is friendly and will make your cappuccino by pouring espresso in a parfait glass full of milk. The result is beautiful but a little pricey at M$40. It’s hard to resists the large pieces of moist homemade cakes (M$20). They also serve breakfast as well as healthy set lunches for only M$65, but the portions are small. Hours: 8:30 AM to 6:00 PM Mon-Sat. Closed Sundays. Hours: 8:30 AM to 9:30 PM Mon to Sat; 9:30 AM to 7:30 PM Sunday. So if you’re wondering why you should go to Oaxaca, being able to drink good affordable coffee is one excellent reason! If you also need food recommendations, check out Where and what to eat in Oaxaca.